The first Halsted trading business was opened in Bulawayo in 1897 by Major C W Halsted under the name of Halsted and Webb. With the outbreak of the Anglo-Boer war in 1899, Major Halsted closed that business and spent the next 3 years fighting with the British forces. At the end of the war, in 1902, rather than return to Bulawayo, Major Halsted opened up a business in Johannesburg acting as an agent for the better known Kimberley mining firms. This business, known as Halsted and Company, was run by Major Halsted until he retired in the 1920’s. He handed over the business to his two sons Paul and Robert. In the late 1920’s Robert moved to Bulawayo to set up an agency business, leaving Paul to run the Johannesburg business. It is believed Robert took over the business of A J Butler & Co. 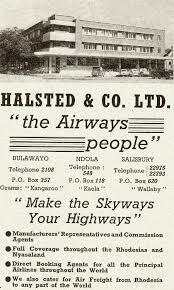 In October 1949, the brothers opened a further jointly owned company in Bulawayo and called it Halsted Brothers Ltd. The Company traded in tools, hardware and specialist products to the mines. When legislation changed, this company was later renamed Halsted Brothers (Pvt) Ltd under which name it still operates today.